Even with all our technology, we still prefer solutions that have a human touch. That’s why we use Siri on iPhone, voice assistants like Alexa or Google Home, and chatbots. We like to feel like we are interacting with someone real. In turn, this sentiment has started to influence the way we shop. Voice assistants and chatbots are being used to shop more efficiently. For instance, Alexa can find you shopping deals just with a voice command, or help you order a pizza without ever having to grab your phone. This conversational element mixed with eCommerce was coined conversational commerce by Chris Messina, former Uber developer. Conversational commerce is the future of eCommerce and search engine optimization as we know it. That’s why social media tools and platforms are being optimized for building conversations online. 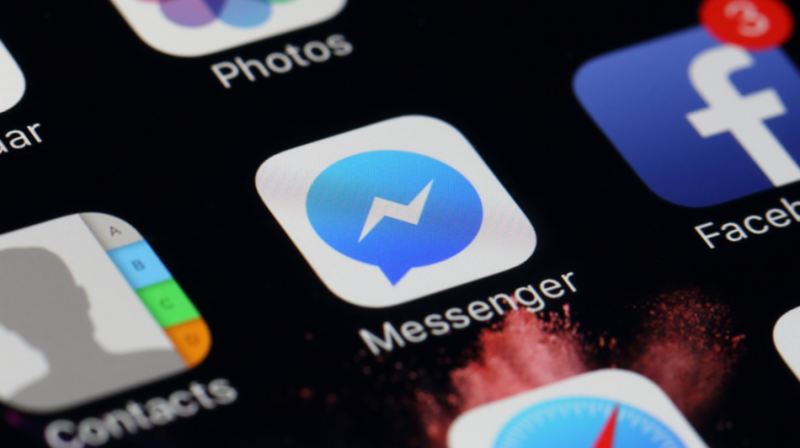 For example, the launch of Facebook messenger ads shows how serious Facebook is about strengthening the platform’s conversational commerce capabilities. This type of ad is ideal for eCommerce stores to jumpstart their conversational commerce strategy. 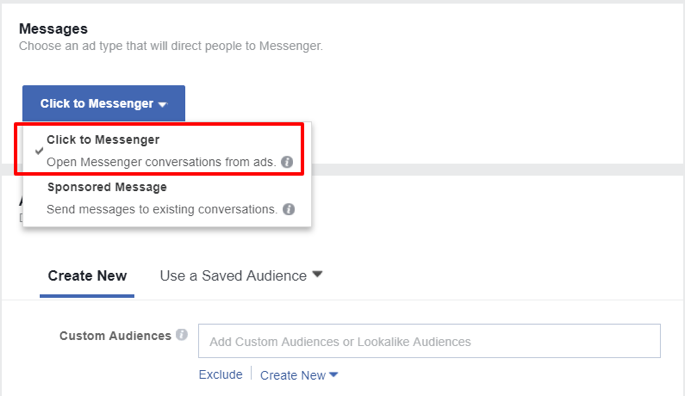 Here, we’ll define Facebook Messenger ads, tell how to use them, and take them to the next level. Let’s get started! This July, Facebook released Messenger ads to expand its ad reach. With Messenger’s 1.2 billion monthly active users and counting, it’s no surprise Facebook decided to launch ads in that space. Also, according to a study, Facebook Messenger is one of the most popular messaging apps, followed by WhatsApp and Skype. Messenger Ads provide a more conversational way to interact with a potential customer. Instead of sending a new target audience to your eCommerce site, you’ll be able to send them an automated message through the Messenger app. Then, you can continue the conversation manually or use a bot to guide users through the purchasing process. 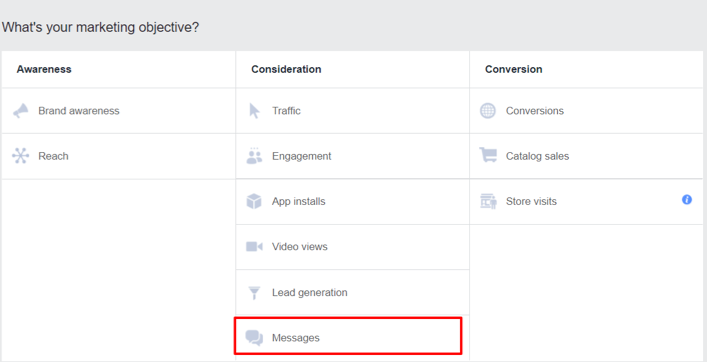 Alternatively, you can also use Messenger Home as a place for ads with other objectives different from ad messages. For instance, you can run a conversions campaign with a Messenger Home placement. 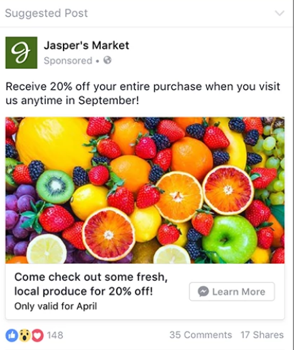 Your ads would show on Messenger’s homepage, and users would be able to click and visit your site. 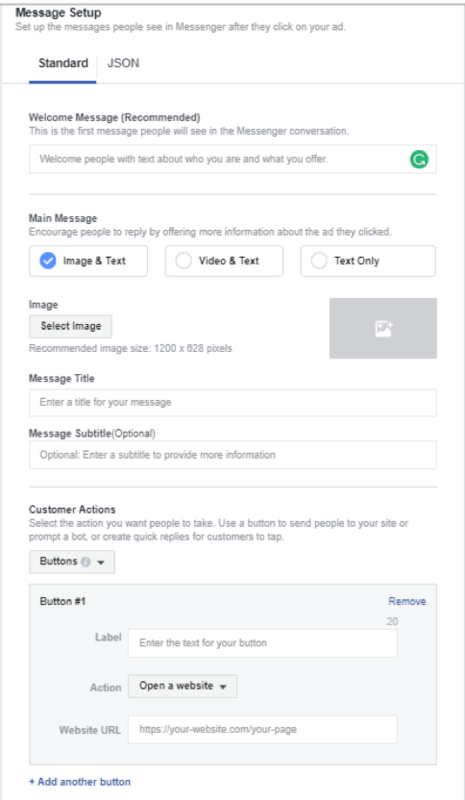 There are 3 different ways you can advertise your products with Messenger ads: newsfeed (click to Messenger), sponsored messages, and Messenger home placement. Let’s dive into each one of them. 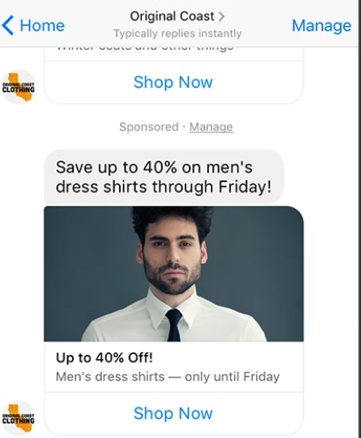 Newsfeed Messenger ads allow you to advertise on your target’s newsfeed, but, instead of sending users to your site, you’ll be able to redirect them to a Messenger conversation. The ad creative process is similar to other types of ads, in which you can use a combination of images and videos to promote. The initial automated message can show as an image and text, video and text, or text only, so you have many different options to A/B test. Note that you can add multiple buttons or quick replies to provide users with different options to choose from. For instance, if you’re selling evening dresses with a slideshow of different products, you can set up three different buttons asking users if they are interested in short, long or mid-length dresses. Each button would have a different URL, and it would take users to the appropriate website section. Then you’ll be able to set up your messages and/or text on the next screen. This is just a placement option for ads with any ad objective — it doesn’t have to be set up with a Messages objective. Users clicking on ads with this placement can go directly to the advertiser’s site if that is the campaign objective. 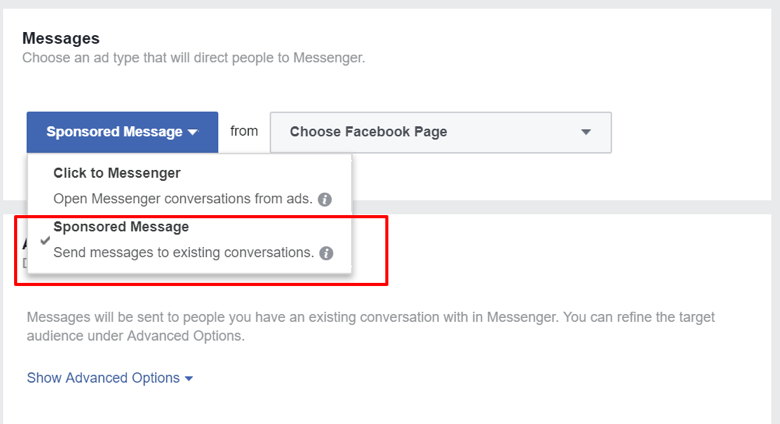 Now that you know how to set up Messenger ads, let’s discuss beneficial ways to use them. Many times, websites can be overwhelming, especially when they are packed with inventory. Using a combination of Messenger ads and chatbots, you can provide users a tailored product suggestion that can avoid them getting overwhelmed. 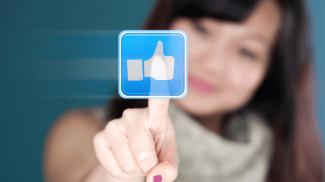 Also, by offering a custom suggestion and engaging with a customer, you’ll be able to create a higher brand sentiment. Let’s say you own a large eCommerce women’s shoe store and you are trying to sell your latest collection which includes sandals, pumps and sneakers for women. So, you create a Messenger ad to better guide users to the right section of your site (pumps, sandals or sneakers) and provide a tailored recommendation that falls within those sections. You’ll be able to set up the first message with Messenger, but the trick is to connect a chatbot to guide users through the whole process. 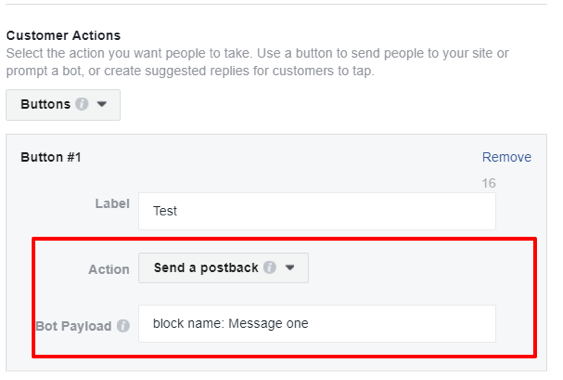 To do this, select the “send a postback” action under buttons. Then add your chatbot’s block name on the “bot payload” section. There are many reasons why a user might opt out of completing a purchase. Some of these reasons may be related to unanswered questions about the product, quality doubts or just second guessing due to a high price. What better way to convince those doubtful users than to engage in a conversation with them? 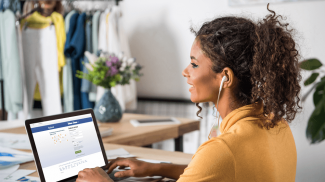 Using Facebook Messenger ads and chatbots, you can create a conversation that feels natural and gets the potential customer to feel more confident buying from your store. For instance, this might be a great solution for a fine jewelry company. The conversation can provide more information about the products and, at the same time, guide them to the right product or products. There are many other ways to use Messenger ads to your advantage. The key is to test different strategies to find the one that works best. Don’t be afraid to experiment with something new and get ahead of the competition! There may be a higher risk for spam for this. But I guess it will be okay as long as the messages are managed. Nice article thank you for your great information Ronald. I am looking for the information about how to set up google shopping ad.